In job interviews, or the commonly suggested term these days “case interviews” the candidate is given a situation of difficulty, problem, question or challenge to which he/she needs to find a tactful solution. Often the problem or inquiry is based on the real-life experience of the interviewer in business affairs. It is an interactive session to analyze the candidate’s abilities. Further, the candidate asks some logical questions to get clarity about the situation and understands the root cause of the problem. Only after that, he tries delving deep into the matter, ponders over it and comes up with a suggestion or an answer. Questions may vary from the most basic and simple ones to the highly difficult ones. Mostly during the hiring of management consulting jobs, case interviews are executed. Case Interview – What Do Interviewers look for? 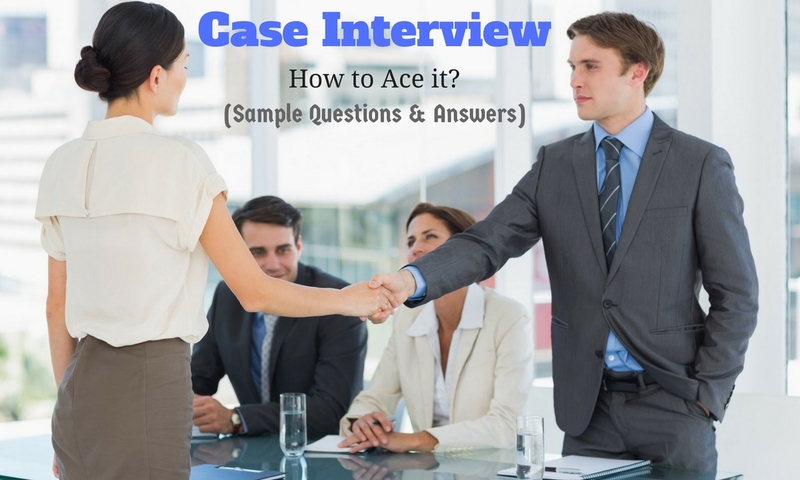 How to ace the Case Interview? One thing is forbidden in case interviews, i.e. you cannot panic. The moment your face shows that you are panic stricken or you become sweaty, thinking about where to start from or which direction might be the right one to start untying the knots, you’re already out of the scene. You cannot let the man/woman on the other side of the table realize your anxiety. The questions are hardly ever straightforward, therefore estimate an idea that neither your answers should be so. Make assumptions or ask recurrent logical questions to gather as much information as you can. Generally, the questions put forward before you already provide you with a bunch of information. You need to take note of every intricacy related to your case and ignore the extra details that were meant to be obstacles to your thinking process. After the interviewer is finished, he would ask you whether or not you have any sort of queries. It is witty enough to never say No. Many people are of this idea that saying Yes might have a bad impression before the interviewer. However, that is absolutely not. On the contrary, that is your way to scour more minutia of the case which might prove to be useful. Also, clarify something if you have even the least of doubts. This would definitely have a positive impact on them that you have listened well enough and did not just sit blank and you would be cleared of any possible misconceptions. This would not only help you in analyzing the problem step by step but also come up with the bigger picture. Where most people go wrong is to circulate around the question, trying to figure out the correct answer and neglect the details altogether. That way the candidate would only end up getting more bound by the trivialities. When you ask questions in a fearless manner in an interview, the interviewer can actually be quite helpful in guiding you properly and have a better perspective of the problem. Therefore, engage him/her in a constant conversation. Try not making it look like a test which you need to pass through, consider it as an interactive session. When you gradually start solving the issues, keep on explaining them to him. Make it a two-way conversation. So that even if you are wrong at some point, he might drop some clues before you in a slyly. However, you need to be witty enough to catch and utilize it. Besides, this helps in developing a better rapport with the interviewer. However, one thing to keep in mind is – do not interrupt him/her in between while telling you about the case. To have a definite idea about the problem, you need to put the squares into the right boxes. And for that, start arranging the details into a sequence from the very beginning into a logical structure. What the interviewer wants to know is how you proceed with your thought, what you do with them and how you make up an assumption out of just mere ambiguous details provided to you. Split the details into several parts like “decreasing market price”, “increasing variable cost”, “selling of new products” etc. Cases upon which general questions asked are – pricing strategies, entering a new market, investing in a new company, launching a new product, plans for progress in the business etc. Once you have figured out the problem type after getting a proper structure, you have a framework to start working on. Just being a bookworm won’t help you get through management job interviews. You need to have a fair knowledge about the market, industry, business trends etc. Reading any business newspaper like “The Economist” daily can be a lot of help in this. There are many case interviewers who give tests online, which you can always try for getting better at this. It is alike mathematics, the more you practice, the better you get at it. You can download PDF files of case studies and go through them as well. Or, grab a friend and start a joint study session. You can openly clear out your doubts by sharing and will have an advantage of mutual sharing of knowledge. Ghana is a nation in West Africa with a population of approximately 24 million. As per the records of 2012, its largest country Accra alone has a population of about 2.3 million. World Bank has ranked its economy as the lower-middle class economy. There are almost over 500 internet cafes in Ghana, and the client of our company is owning the largest internet café in Accra – Busy Internet. Since the company has been facing a consecutive decline in its profit line, the Managing Director has hired your company to find out the possible problem as well as recommend plans for improvement. What do you think would be your answer? The candidate would be at an obvious advantage if he has any knowledge about the Ghanaian economy. However, if one has not, then at once start arranging the details into a structure to have a framework of the position of the nontraditional business market in Ghana. The fact that the economy has not progressed very well is evident from the declaration by World Bank. Therefore, the possible suggestion can be that Ghana’s market still needs to be polished enough for such technological business to flourish. Also, implementation can be done by focusing on the employees of the café and their convincing skills. To hold onto customer loyalty, the growing demand needs to be met up. The client of Bain and Company is The Ministry of Railways of China, which is responsible for the management of the railway industry, the facilitation of services to the passengers and the maintenance of the railway infrastructure and plans for the growth of such a blooming industry. The Ministry also is in charge of the 16 railway bureaus and 2 companies operating in the mainland of China. Beijing and Shanghai are two of the most important cities and economic zones in the country. The Ministry had been planning an investment in developing a high-speed railway network for a proper communication between these two places. They have turned to your company Bain and Company to counsel them in this regard whether they should or should not go with their plans. How would you do that? Estimation can be made about the population of China using the railways. Also, a difference between regular railway network and a high-speed network can be sought beforehand and the budget which would be needed to execute this particular plan. This will give a probable idea of the market size the company would be dealing with. A list of possible advantages and disadvantages of the plan can be looked into to suggest anything on the matter. To go ahead with this plan the profit line can be checked. The population of these two cities in specific is to be checked as well and the competitions of the side transportation systems like the roadways or the airlines. After going through a list of question to ask and explanations, the framework would be ready. So the ultimate advice would be to properly campaign for the project, association of national pride with such a progressive development, keep the initial price of the tickets lower to increase the sales (till a stable considerable period of time). The client of our company is The Minnesota Mining Manufacturing Company of United States whose main office is in Minnesota, United States. The company manufactures products such as car décor products, medical products, adhesives, electronic products and dental products etc. On a global level, the company is a thriving one with its employee population of over 84000 and product types of over 55000 and business in over 60 countries. One of their major investments is in Brazil, which is the manufacturing of a particular kind of steel that is only produced by two other companies in Brazil. Throughout the world, Steel has an amazing market capture and increasing demand. Now, the company has hired BCG to frame a plan for the progress of this business only after acquiring a proper knowledge of the market trend. What would you do about it? The candidate would begin by discussing the market dynamics in Brazil as well as globally on which he/she has to base the suggestion. Furthermore, an idea is to be framed up about the cost, market, value, customers, transportation facility and price if the steel is to be exported. Also, Brazil has some taxes on foreign goods export which would only add up to the price. Since the local market is more profitable than the international trade, it is advisable to try out the products first in the local market of Brazil since there is a chance of price war. The client for our company this time is the Moldovan Coffins who has a high reputation for making best quality coffins in Moldova. The country of Moldova has Romania to the west and Ukraine is surrounding the country from all other three sides. The country finally declared itself independent in the year 1991. As per the records of 2001, it has a population of only 4 million. But lately, the owner of this company is having second thoughts on remaining in this age-old business. Till date, the company had manufactured handmade coffins which required more labor. However, with the introduction of the new technology in the market which uses less labor and gives comparatively more production the owner is in a dilemma whether or not to invest in it. How would you solve his dilemma? Some key points need to be focused, to begin with, which includes the alternatives such as – selling value of the business to a third party, buying the machinery for new technology, continuing with the same old technique or sell the assets and lockdown the company. Now, estimation is to be made of the death rates, population growth, average life expectancy of the market. After calculating the numbers, a possible threat to the business has been noticed. Therefore, it is suggested to sell the business. There is no such particular correct solution that the employers are looking for. Through this, they examine the candidate’s approach towards the problems, thinking ability and calmness in dealing with it.